Meet Cameron Riley, actor, writer and tour guide extraordinaire. 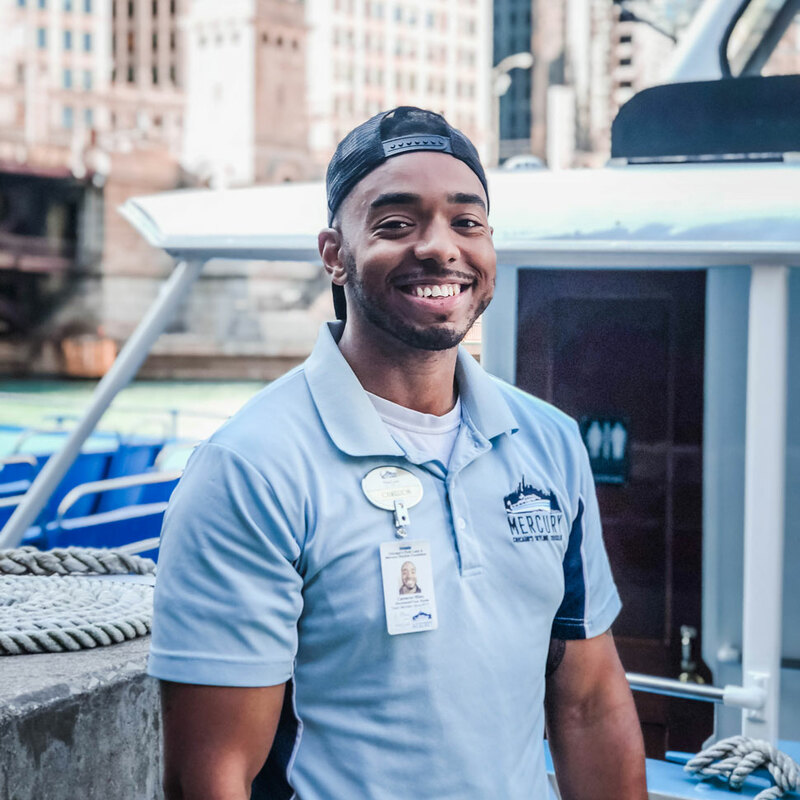 A Chicago native, this is Cameron's fifth season with Mercury Cruises. Described by former tour guests as "exceptionally funny", "informative" and "personable", Cameron's trademark commentary is peppered with interesting Chicago stories and charmful wit, bringing laughs and smiles aboard every tour. 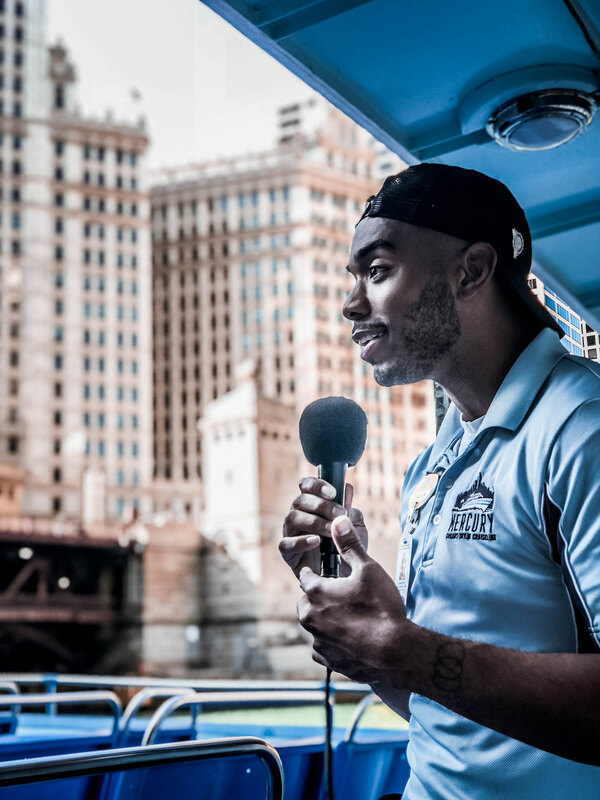 When he isn't hosting guests from around the world on a tour of his hometown, Cameron is an emcee for his own entertainment group that gives local Chicago artists venues to perform their craft. Cameron is also a proud member of 100 Black Men of Chicago, a group focused on mentoring black males. What was originally supposed to be a job to help me pay back some student loan debt evolved into a passion for history and teaching of people in an informative yet educational way. A vet. A firefighter. The president. A ninja turtle. What is your favorite building on the tour and why? 150 N Riverside. My mom works there. Plus it just looks dope. 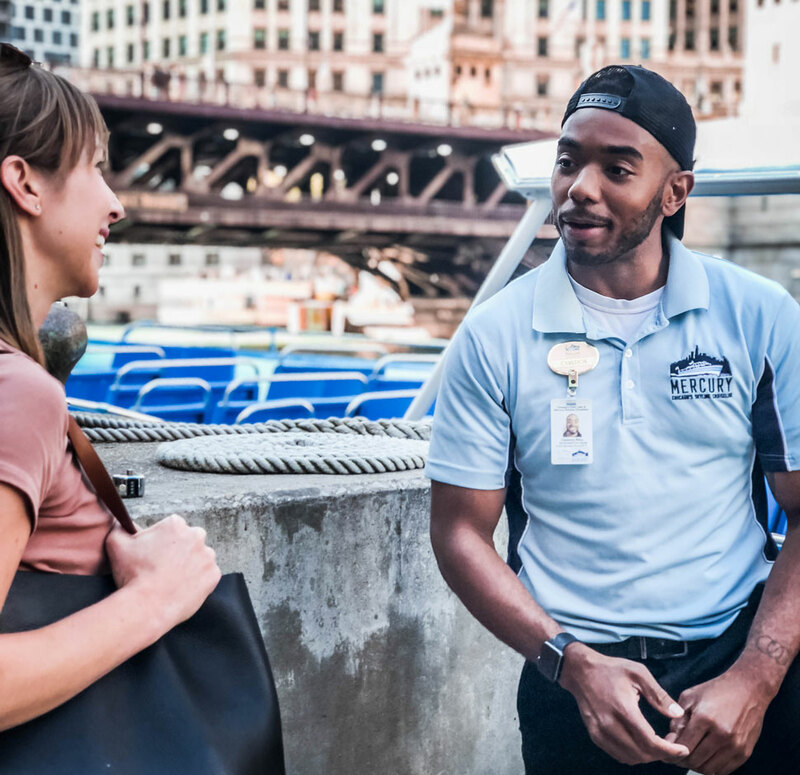 Tell us about a memorable experience on the job at Mercury Cruises. I was on a charter once for a passengers 60th birthday. I led the whole lock in a giant birthday chant. The woman teared up it was so wholesome. What are three passions of yours? Where in Chicago is your favorite place to…. Grab a great cup of coffee/tea – I drink neither these but I will grab a fruit smoothie from The Lab off 95th. I know the owner. What’s something about Chicago that is a “hidden gem” of yours? It’s perfectly reasonable to have a beachside picnic. 35th street beach is the best one in the city. What is the next destination on your travel wish list? What has been your most interesting customer interaction? Ooohhh so many. I’ve seen my fair share of celebrities and big suits aplenty but the one I cherish most is having met the director of all of Chicago’s public art. We waxed poetic about the pieces new and old and I learned some valuable tidbits I include on the tour. I don’t talk much when I’m off the mic so people are surprised to talk to me in general. Do you have a favorite vessel? If yes, which one and why? The Queen. You can hear the history in the roar of the engines. It’s humbling to work one of the boats that started it all. Tell us about a memorable charter. I like working weddings because I get to dance with the passengers if we’re on a less crowded portion on the river. What is your favorite part about being a tour guide? Every passenger has a unique story. People come from all walks of life. It’s humbling to learn to level with such people from across the globe.